Blue, of Cokesbury United Methodist Church, told Knoxville News Sentinel he tried out for "The Voice" after his London based fiancé, Stephanie Dunkley, was diagnosed with bone cancer. After her diagnosis, Dunkley underwent a bone cancer transplant to save her life. It was at that moment, a light bulb went off. "When everything happened with my fiancé and her story, I realized that life was just too short," Blue said. "And after God was kind of pushing me to go forth, and I was declining and saying 'No. This can't be...' I asked that He would just confirm, and He did, and when He did, I would say that really did help push me and helped me overcome the fear and just do it." 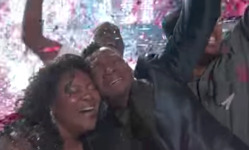 "The Voice" host Carson Daly announced Blue as the winner this past Tuesday night as confetti fell from the ceiling and the show came to a close. Overcome by such emotion, Blue bent down and fell to the ground and stayed there until a family member helped him stand up when they got on stage to celebrate with him. Blue competed against Michigan native Lauren Duski in the finale round. For Blue's last song, he preformed this original song: "Money On You." 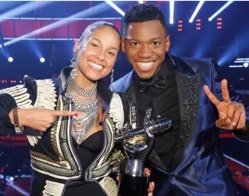 Blue was selected by Alicia Keys to be on her "Voice" team during the blind audition process after he moved the judges: Keys, Blake Shelton, Adam Levine and Gwen Stefani when he performed a stunning and soulful rendition of "Tracks of My Tears" by Smokey Robinson & The Miracles. Through the season, Blue has opened up about his relationship with his fiancé, Dunkley and expressed how winning would mean the world to her. After his blind audition, he told of how she flatlined during her treatment and it was then and there he realized he would "never let her go" again. Even before the last episode aired, Keys said, "It would mean so much to see Chris win this." During the finale, before Blue's last song, he performed "Everybody Hurts" with Usher, who served as a coach on Season 6 of "The Voice". The duo's performance was dedicated to everyone around the world who may be struggling with something and it was also a tribute to the Manchester Attack, a deadly incident that left 22 people dead and many people injured. Blue also had a whole army of people behind him this season. Knoxville Sentinel reported, Cokesbury United Methodist Church, Overcoming Believers Church, Knoxville Christian School and the Empty Cup coffee shop hosted "The Voice" watch parties to support Blue on the show. As the grand prize, Blue received $100,000 cash and a record deal. He plans on using it to give his fiancé the wedding she deserves, USA Today reported.